Congratulations to Brother Joseph Kurt Nugent, S.M., who professed his first vows in the Society of Mary, Province of the U.S., during Mass at Queen of Apostles Chapel at Mount St. John in Dayton, Saturday, May 19, 2018. The Rev. Bill Meyer, S.M., provincial assistant for religious life, celebrated the Eucharist and The Rev. Chris Wittmann, S.M., director of novices, was the Homilist. Brother Joe Kamis, S.M., assistant provincial, received the vows. A reception and dinner followed at the Daniel J. Curran Place on the campus of the University of Dayton. 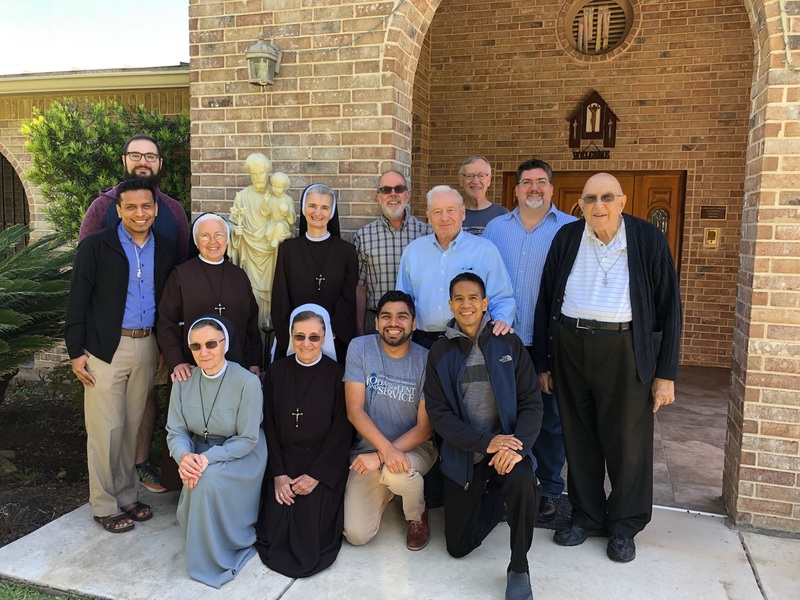 After nine years, the brothers of Casa Maria returned to the Shrine of Our Lady of Czestochowa Retreat Center for their spring semester retreat, April 13-15, 2018. Merry Christmas from the Casa María Marianist Community 2017. The annual tradition continues with a trip to Devine Acres Farm to purchase a Christmas tree, Saturday, Dec. 2. Having learned from previous years (2016, 2015, 2014, 2013, 2012, 2011), the brothers set out to purchase a 10-foot Leyland Cypress to fill the area where the tree is displayed in the community. With four making the trip, the tree rode on top of the community van on the way back. Weather conditions were sunny in the mid 70s so they prepared by bringing ice water to stay cool and hydrated. They also remembered to bring towels to place next to the tree so they can lie of them while cutting the tree down. To get there from campus, head down Esmerelda Street and take left on Highway 90, which then becomes Highway 10 East. Then follow 35 South Laredo and take Devine/Jordantown Exit to Hwy 173 (WalMart is right at that corner). Then turn left on the fourth traffic light to Market Road 2200W. Destination is about a mile down this road on the right. ¡Felicidades a P. Armando José Añeses Bocanegra, S.M.! Congratulations to Rev. Armando Añeses, S.M., who was ordained to the priestly ministry of Jesus Christ in the Society of Mary, Province of the U.S., during Mass at Colegio San Jose, Rio Piedras, Puerto Rico, Saturday, Nov. 25, 2017. As part of the bicentennial celebration of the Society of Mary, students, alumni and friends of the Casa María community gathered to celebrate Casa Tuesday on Oct. 3, 2017. ¡Bienvenidos! Welcome to the official Casa María Marianist Community blog. This work-in-progress serves to document our events and activities—much like traditional community annals, but in electronic form. We also hope that through the witness of our lives shared with the larger online community, visitors may participate in discovering the gift of the Marianist charism through this blog.